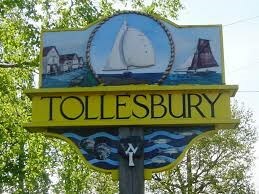 From 1904 to 1951 Tollesbury was served by the Kelvedon and Tollesbury Light Railway, with a small station on the north side of the village. The railway continued to Tollesbury Pier south-east of the village, where promoters hoped to develop land for bungalows, houses, and a yacht station. However these plans came to little, and the Tollesbury Pier extension closed in 1921. During World War II the pier was destroyed as an anti-invasion precaution, and the area used for defensive guns and to control electrically operated mines blocking the River Blackwater estuary. Tucked away in the south east corner of the Square, by the church wall, stands the village Lock-up or Cage. This wooden building would have been where drunks were held until they sobered up. With the village having six public houses at one stage, the Lock-up probably saw quite a bit of business itself. The cache is not at the listed coordinates. To find the cache go to the village sign and find out the following information: Please be aware that due to other caches in the area, this cache is a short distance away from the village sign. ************************************** If anybody would like to expand this series please do. I would just ask that you let SmokeyPugs know first so they can keep track of the Village Sign numbers and names to avoid duplication.